Around two in the morning, the crew of Bounty donned their bright-orange survival suits. For hours, water had poured into the boat much faster than it could be pumped out, and belowdecks, the twin John Deere engines were submerged. Bounty was now adrift—completely at the mercy of Superstorm Sandy. Deckhand Josh Scornavacchi was still not convinced that the Bounty would have to be abandoned, but he knew it was better to be safe than sorry. The suits—what sailors call “Gumby suits,” after the bulbous, ungainly form their wearers assume— were made of heavy neoprene. They would protect against both cold water and flame, in the unlikely event that the electrical fires spread through the Bounty. Scornavacchi zipped the waterproof seal on the collar closed and attached a small rubberized plastic bag to his climbing harness with a carabiner. Inside the bag was his ID, a pocketknife—the essentials. John Svendsen, the first mate, was in the navigation shack, his Gumby suit only halfway zipped. He seemed to Scornavacchi to be much less concerned with his own safety than with the safety of the crew. He inspected each sailor carefully, like a commanding officer before a battle, tugging on straps, double-checking rescue lights, slapping shoulders and patting backs. Scornavacchi thanked Svendsen, and joined deckhand Claudene Christian near the mizzen fife rail, which surrounded the aftermost mast. The clouds he could make out overhead in the darkness were low-bellied and full, and a strong wind blew across the deck. Christian was clearly scared but putting on a brave face for her friend, and she smiled brightly at Scornavacchi. After receiving the OK from Svendsen, volunteer sailor Doug Faunt waddled sternward in his Gumby suit and lay down on the deck alongside deckhand Adam Prokosch, who had suffered a back injury. Prokosch’s eyes were half-closed, and he had his hands crossed over his chest, kind of like a corpse. The Bounty was heeling badly to starboard—40 degrees or more, Faunt guessed. He wasn’t so much lying down as standing up now, with his feet on the railing, the sea frothing below him and lapping at his feet, the ship looming over him. The Coast Guard C-130 passed once overhead, the sound of its engines reduced by the storm to an insect-like whine. Gazing up, Faunt caught a glimpse of the big silvery wings of the plane, and the moon glowing faintly through the clouds, and then he was asleep. That he was able to nod off on the deck of a doomed ship was a testament to the extent of his exhaustion. He had been working for 48 hours straight, give or take, many of them in the sweltering hell of the engine room. He was dehydrated, he was hungry, his joints ached and his lungs burned. He was strong, but he was also 66 years old, and he had his limits. Faunt later figured that he might have slept for an hour, but given the speed at which the Bounty rolled over, it was probably half that. When he opened his eyes again, the deck was fully vertical. He bent his knees and pushed off into the sea. The storm swallowed him whole. Now commenced a jarring, vicious cycle. Faunt would push his way to the surface, and a wave would drive him back under like a hammer pounding the head of a nail. The Bounty’s engines were submerged now, and there was plenty of diesel in the water. Faunt was an experienced diver, and he did his best not to open his mouth. But the strength of the ocean was stupendous, and he couldn’t keep the salt water and diesel out of his throat. He spit out what he could and swallowed the rest. At irregular intervals, a body in a survival suit would float past him, and Faunt would holler and wave, but it was useless. Nobody could hear him, and he couldn’t distinguish one sailor from another. Zipped into the Gumby suits, they all looked the same, cartoonish orange shapes silhouetted against the dark sea. He caught hold of a life preserver, but it appeared to be tethered to something—maybe to the ship itself, he thought. He was afraid she would plunge, and that he would plunge with her. So he let go. What surprised Faunt—what he would often think about in the days to come, first back at the Coast Guard station, and then in his cluttered bedroom in Oakland—was the strange tenacity of the human brain. The brain, the mind, maybe the spirit—whatever you wanted to call it, the thing that did not allow Faunt to give up, even when he probably should have given up, dropping his hands and surrendering to the ocean. It simply never crossed his mind that he might be dying. The fact that it didn’t, he figured, probably saved his damn life. *** A sinking ship creates a funnel on the surface of the sea—planks of wood, life rafts, and human bodies can be sucked down behind her. From his training, Scornavacchi was familiar with this effect, and after jumping clear of the Bounty, he fought hard to get a safe distance away from her. But swimming in a Gumby suit is incredibly awkward, and his progress was maddeningly slow. The sea around him looked like a flushing toilet. Everything he grabbed at—stray planking, strands of line—was ripped out of his hand. Gasping, his lungs filling with salt water, he fought his way back to the surface. 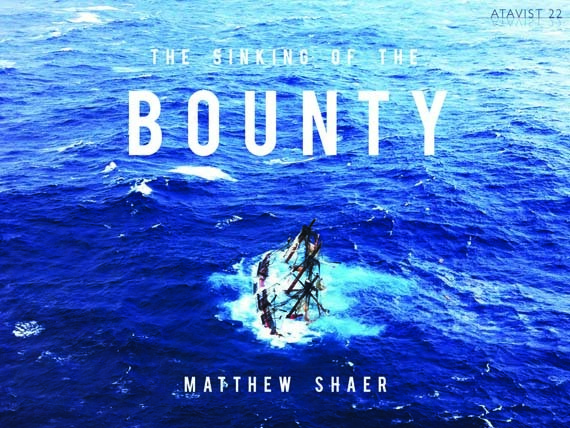 There appeared to be no one left on board the Bounty, which had now fully capsized. Indeed, there appeared to be no one around at all. Before he could ponder the particulars of his plight, he was yanked underwater again by some invisible force. In movies, sinking ships lurch through the deep like whales, their every contour visible to the camera. Scornavacchi could see nothing. It was dark enough on the surface, and an inky pitch underwater. But groping around with both hands, Scornavacchi did figure out what was pulling him down: some of the rigging had caught onto the small bag of essentials lashed to his harness. The weight of the ship pulling on him made it impossible to unhook the carabiner, and the bag was made of heavy-duty PVC plastic, which offered little hope of breaking. He was going down—five feet, then ten, fifteen. He could feel himself starting to drown, losing the ability to think or use his muscles. His lungs were filling with seawater and diesel. Just before the Bounty left New London, Scornavacchi’s mother had fretted about the storm. “Mom, I’m not going to die,” he had told her. Now here he was, about to break his promise. He was furious with himself. He thought about his 11-year-old brother, too, and of all the other people he would never see again. I’m sorry, he thought. I’m so sorry.